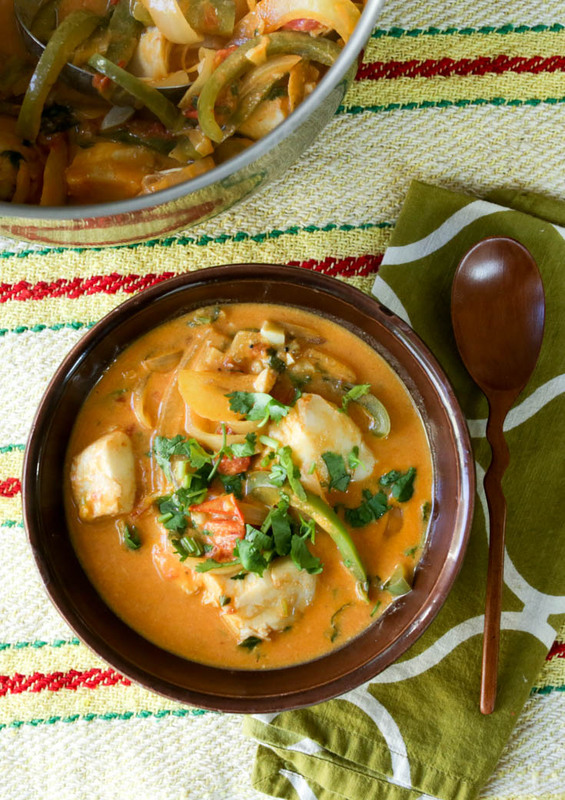 Moqueca is a dead-simple, Brazilian seafood stew characterized by coconut milk, bell peppers and dendê oil. Dendê oil is also known as red palm oil. Red palm oil is pressed from the fruit of oil palm trees and has a beautiful bright orange-red color. Its taste is somewhat meaty; its fragrance is slightly of anise; it’s unique. Palm kernel oil is the oil pressed from the kernel of the fruit. It has a much higher saturated fat than palm oil and lacks the bright color. If you’ve even a moderate interest in saturated fats or rainforest destruction, these oils are probably on your radar. Palm kernel oil is used heavily in processed foods like packaged baked goods and peanut butter (Nutella is infamous for its reliance on palm kernel oil) and oil palms are high-yielding oil producers. High yield means more dollars per tree. As such, oil-palm trees are in high demand and in many parts of southeast Asia in particular, natural habitats are cleared to plant oil-palm monocultures. You can find certified sustainable red palm oil that is grown and harvested without damaging rainforest habitats. If you can’t or don’t want want to use it, substitute olive oil. Fish and/or shrimp can be used in moqueca. Our favorite is to use cod or orange roughy but sea bass, mahimahi, halibut, or any firm white fish will do. If you like shellfish, use peeled and deveined shrimp. Some recipes also add squid or octopus. To use that, cut them into rings and add for just the last 60 seconds of cooking so they don’t get tough. This recipe makes enough for 4 servings but is easily doubled to serve more. Leftovers reheat surprisingly well. Serve moqueca on its own as a soup, but my favorite is to serve it with white rice. Cut the fish into large chunks, about 2″. In a large pot, heat the oil over medium heat until warm. Add the onion and saute for about 5 minutes or until softened. Add the peppers, tomato, garlic, cumin, salt and pepper and saute 60 seconds. Add tomato sauce, coconut milk, lime juice and cover. Cover and bring to boil. Taste for salt and lime, adding more if needed. Yay Hilah! Thankyou for mentioning the thing about palm oil! Its a really big issue right now and the big food companies are destroying the rainforests and are major contributors to carbon emissions, pollution, endangering rare species and hundreds of thousands of people have actually died as a direct result of deliberate burning of the forests, from pulmonary illnesses from all the smoke. Indonesia’s forests were devastated in 2016, one fire was five thousand kilometres long and caused so much smoke NASA photographed it. The companies responsible were granted licences to do it all over again just a few months later. All for the sake of Nutella, cheap chocolate eggs which don’t actually taste all that good, and paper. Also the peat soil is still burning underground releasing hundreds of thousands of tons of methane, sulphuric and nitrous compounds. Peat can burn for centuries. However, palm oil and palm sugar are available from sustainable sources and I am not saying anybody should not look out for recipes like this one, and enjoy lovely healthy Asian and Latin American food. If anybody wants to check the data you can just google it cos it was a really big deal and The Guardian UK newspaper and Greenpeace made a big thing of it. Thankyou again for this recipe Hilah! You’re so cool ???? oh yeah the food looks yummy too. Well, my daughter and I whipped this one up last weekend.. Me thinks the dendê oil might have improved the outcome. Maybe my taste buds were expecting something more “kicked up”? Since then I purchased the oil and will try this one again. It’s a pretty mild-flavored dish. Try with the dende, but also add a little more lime juice or some hot sauce if you like. We found a hot sauce at the Brazilian market that’s made from the malagueta pepper, but a habanero salsa or something like Tabasco would go well, too. I am going to buy the dende oil to try it again using shrimp. I enjoyed it a lot. It’s a fast recipe and I like that. I made it last night and like the mild flavor. I want to try s different brand of coconut milk. I expected more coconut flavor. Also you ask for 15 oz. and they only sell 13 oz cans. Do that count also be the reason for weak taste. Haven’t written for a year but still enjoy your program. A 13 ounce can of coconut milk should be fine. They’ve slowly been reducing the size of the cans, I think (like tuna cans). I would suggest getting a full-fat coconut milk unless you’re on a low-cal diet. It has more coconut flavor than light coconut milk. My husband and kids are not fans of coconut milk but LOVE this dish. I use red palm oil, a bay leaf and the only seafood I use is shrimp. I also add a splash of Sriracha. It’s so delicious. Next time I will try folding in chunks of Dungeness crabmeat towards the end.